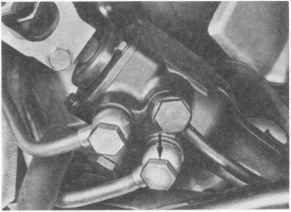 Defects in the power steering arise as the result of a lack of oil in the hydraulic system. Because of the high oil pressure which builds up in the hydraulic circuit, even small leaks may lead to a loss of fluid, damaging the servo pump. Rumbling noises from the steering as ist is turned or foam in the lluid reservoir indicate low oil level and / or air in the system. Before refilling the reservoir, eliminate any leaks on the intake side or replace the defective component on the delivery side. It Is not permissible to repair or disassemble rack and pinion steering gear. Repairs to servo pumps are impermissible, al-tough the pumps can be resealed (page 48 - 8a). Replacement steering gear and servo pumps are available on an exchange basis in a number of countries. In some cases, it may be possible to have the steering gear and the servo pump repaired by a main service agent in countries without exchange facilities. 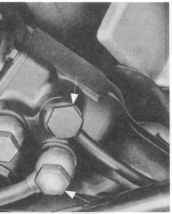 Tension is correct when light thumb pressure applied at a point midway between the two pulleys deflects the belt by approx. 10 mm. With the engine running, turn steering wheel to full lock and keep it in this position. This causes the maximum possible line pressure to be built up. Check all line connections for leaks in this position and retighten if required. Run this check for max. 10 seconds. If checks are made for a longer interval, allow for a short break approx. every 10 seconds. 1. Pull off or unscrew cap of hydraulic fluid reservoir. Reservoir is mounted on wheel housing in Engine compartment. The reservoir installed in cars earlier than model year 83 has a fluid-level mark (version A). 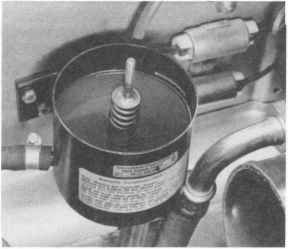 As of model year 83, a modified reservoir is installed with a dipstick mounted on the cap (version B). 2. Start engine and allow to idle. With version A, the fluid level should be at the mark stamped on the reservoir. With version , wipe dipstick, screw cap down and remove. The fluid level must be between the two marks. If necessary, top up with ATF DEXRON II D.
1. To refill the entire system after installing new steering equipment or lines or after a heavy loss of hydraulic fluid, start engine briefly and switch off again immediately after starting. Repeat this process several times. This will cause the fluid level in the reservoir to drop quickly: keep the level up to the max. mark by continously adding fluid. Do not allow the reservoir to empty. 2. 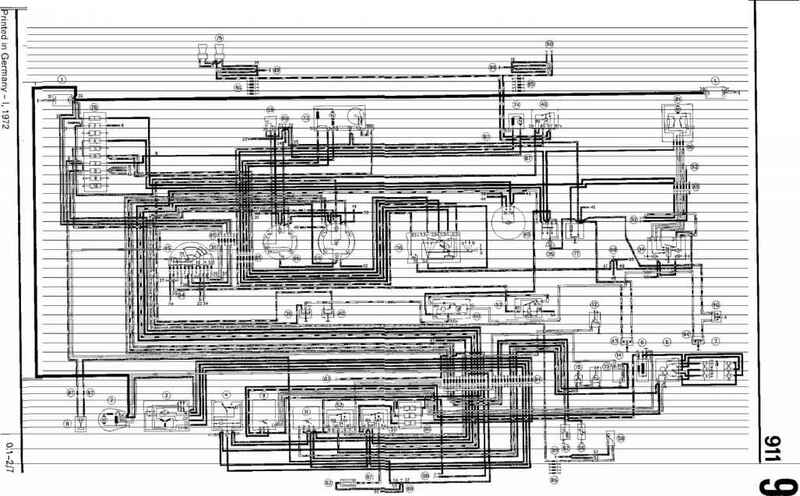 Continue the process described in point 1 until the fluid level in the reservoir stops dropping, then restart engine and allow to idle. 3. 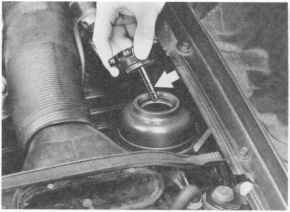 Quickly turn steering wheel several times from lock to lock, to drive all air out of the cylinders (when end position of piston is reached, do not pull harder on steering wheel than required to turn steering; avoid building up unnecessary pressure at this stage). 4. Observe fluid level during this process and, if level continues to drop, keep adding fluid unit) the level in the reservoir remains constant and air bubbles cease to rise in the hydraulic fluid when the steering wheel is turned. 5. When the engine is stopped, the level of fluid in the reservoir should not rise by more than 10 mm. If the difference between fluid levels with engine stopped and engine running is more than 10 mm, there is too much air trapped in the hydraulic fluid. 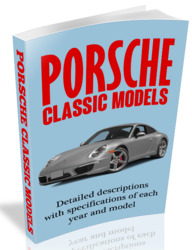 All parts (1 through 6) can be used for 928 and 944 cars. 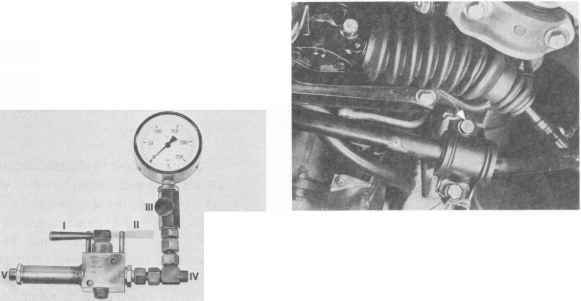 Pressure gauge is connected between pressure line and steering gear (944: between power pump and pressure line). If old pressure gauge no. 3 (see below) is used, make sure high pressure hoses no. 2 and no. 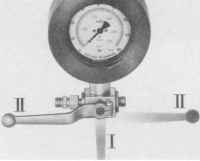 5 are connected on pressure gauge in correct position (opposite sides as for 944). 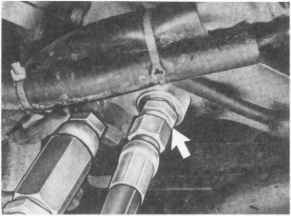 Connection of high pressure hoses on pressure gauge no. 3 a, on the other hand, can be made on any side. * Threads will be M 18 x 1.5 or M 16 x 1.5 depending on pressure gauge version (see Tool Table). local manufacture (see sketch, page 48-9). local manufacture, deviates from sketch. Threads not M 18 x 1.5 (for gauge no. 3) but M 16 x 1.5. M 18 x 1.5 and sealing head on one end and M 18 x 1.5 with flat seal on other end. for gauge no. 3 a: M 16 x 1.5 with sealing head on one end and M 16 x 1.5 with flat seal on other end. Old version, no longer available. 2. Detach pressure line at steering gear. Catch hydraulic fluid, but do not reuse. Tester (pressure gauge) is installed between pressure line and steering gear (rotary piston valve). Make sure of correct installed position when using old pressure gauge. Connections and lever positions are marked with numbers for better understanding of the following instructions. 1. Unscrew bolts from stabilizer bearings and pull down stabilizer far enough that pressure line hollow bolt is accessible. 4. Screw connector with high pressure hose no. 5 on steering gear (seal required: 14 x 18). 3> Bjiil CiGWfV-prg&SL}Fe liRg. whis^v^doss. f^st- rc -quire loosening mounting clamp of lines. Connect 1.5 meter long high pressure hose no. 2 to pressure line using the hollow bolt and adapter no. 1 (seals required: 2 x 14 x 18 and 1 x 18 x 22 or 1 x 16 x 20). pressre hoses and place on a base (e.g. toolbox) next to driver's door.